You can customize products on Upinus's Pinned List and on Shopify. You can change the product title, add it to Shopify collections, set the product type or assign tags. Take note that only manual Shopify collections are shown in the drop-down as products to the automatic collections are assigned automatically. Collections, types and tags help organize the products better in the Shopify store. 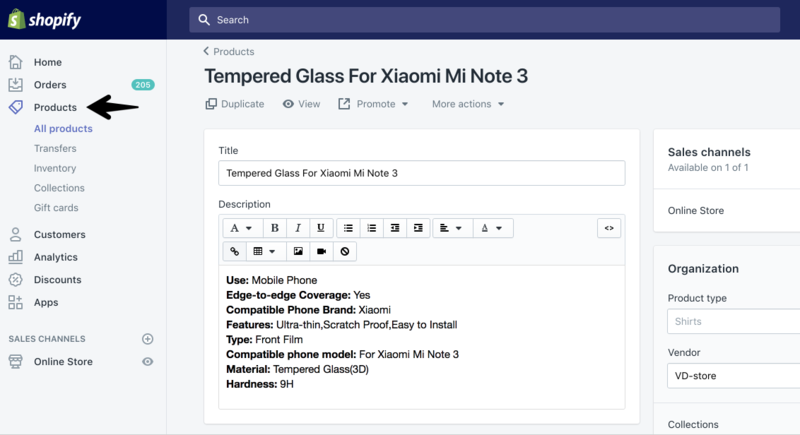 Use the editor to edit product description, add images or insert links if needed. On the Variants tab, you can rename SKUs, variant names, manually set the product price and inventory. There are some specifics, which can be customized in bulk. Select several products and click "Edit products" or "Actions" button for more customization possibilities. After the product is published in the Shopify store, you can only customize it in Shopify admin. There is no way to transfer pushed products back to the Import List. You can find all your products on the "Products" page.